Welcome to The Style Brunch!!! 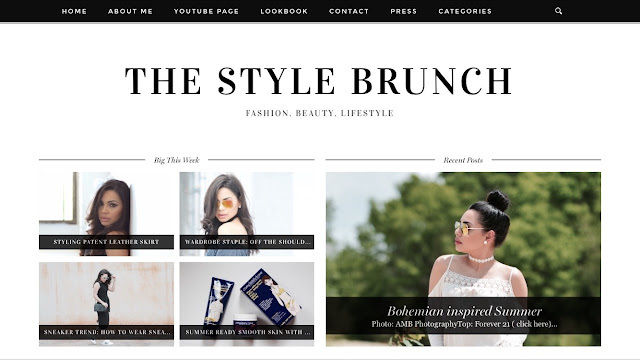 I am so excited to announce that my blog has evolved and is now called The Style Brunch. I am excited to start on this new journey with a new name and a new blog makeover. I want to share with you all more of my life and more lifestyle posts. I felt that the name AlanaMarieStyle didn't fit my new ideas and content. After deliberating and writing different name ideas on pages and pages of paper I loved The Style Brunch. Why The Style Brunch?! Its catchy and its a combination of two of my favorite things, Fashion and Food specifically brunch! Brunch is one of my favorite meals of the day. Breakfast in the late afternoon... oh yeah oh yea!! I love the magazine style layout. Its clean but yet interactive and stylish. I think I might tweak a few things but other than that I love it and I hope you guys as well. Let me know your thoughts and I want to say thank you all for following and supporting me on my dreams. This industry is not easy and is a high mountain to climb but its my dream and goal to be able to blog full time and I look forward to that one day.. Thank you guys and enjoy your weekend! I will be going to Chicago for the first time to catch a baseball game at Wrigley Field with my fiancé. Its a quick 24 hour trip but we are so excited because its a cross off our bucket list. If you want to see our trip catch me on Snapchat: amrod123.